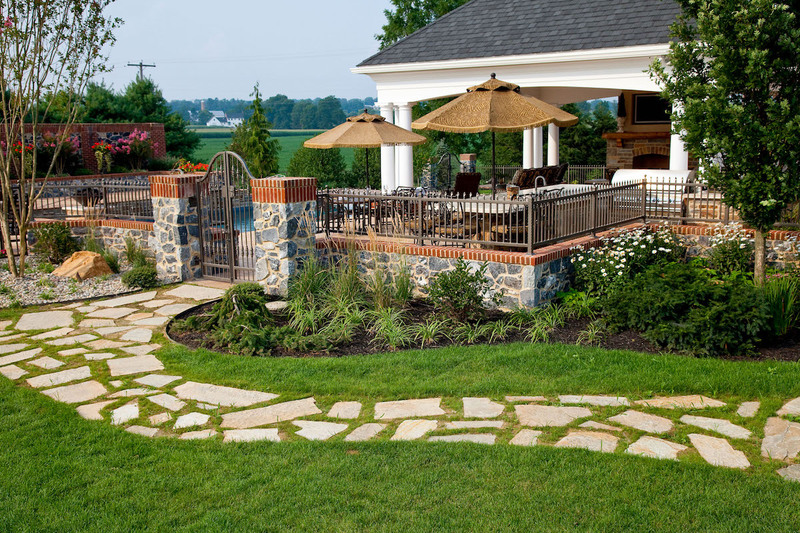 Any good landscape designer takes the wants and the needs of the homeowners they’re working with into account. 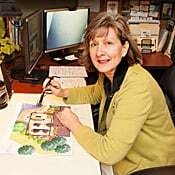 And, every homeowner enters the design process with a different level of involvement. Some have lots of ideas of their own while others are looking for direction. This particular Manheim, PA family was one that came into the process with some very specific wants and needs in mind. They loved customization and were not afraid to put their personal stamp on any home project they were working on. When it came to designing their brand-new outdoor living area, they were looking for something truly unique. At the start of this project, the family had a large grass yard and a gazebo. That was it. It was essentially a blank canvas from which they could create their dream space. 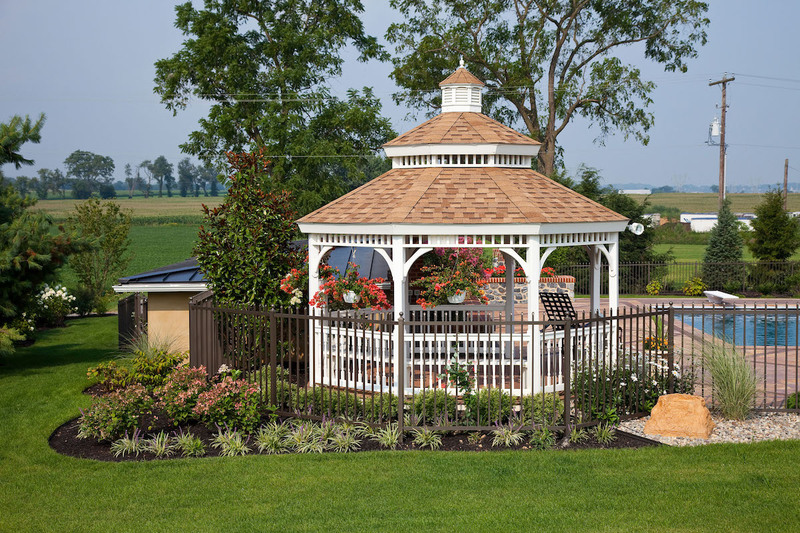 Because the gazebo held sentimental value, the homeowners wanted it to remain, even as new features were added around it. 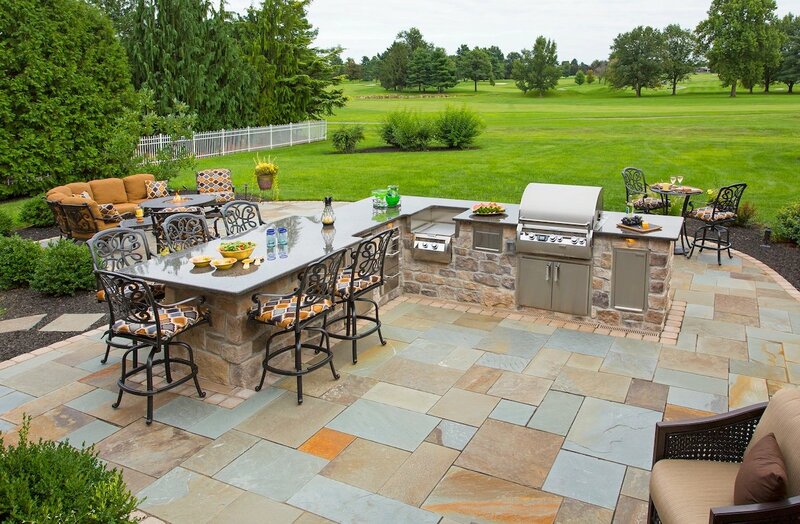 The family was looking for a complete backyard space that would include a pool, an outdoor kitchen, a pavilion, and even a putting green, among other features. They entertained frequently and wanted to create a space that would make it more enjoyable to do so. Inside the family home, everything about it was customized. They had been very involved in updating their Lancaster County, PA farmhouse in a way that suited their exact style. 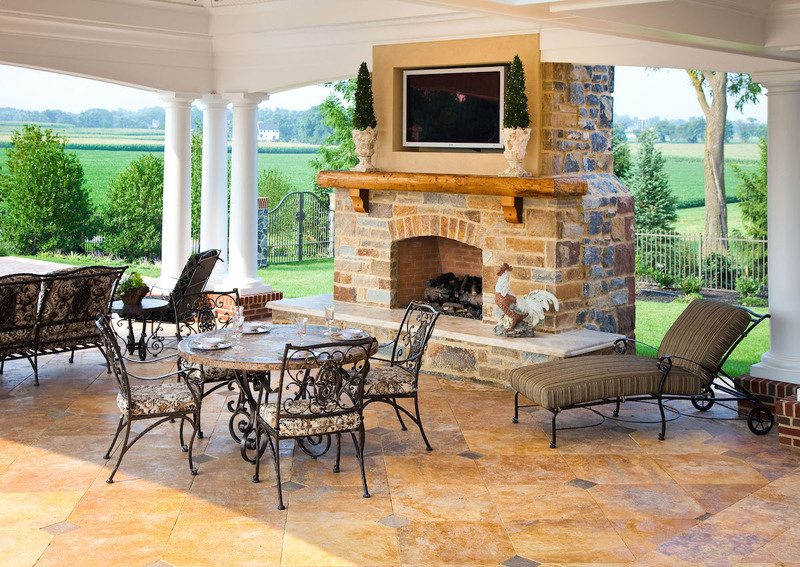 So when it came time to do their outdoor living area, they were certainly not afraid to go the custom route. 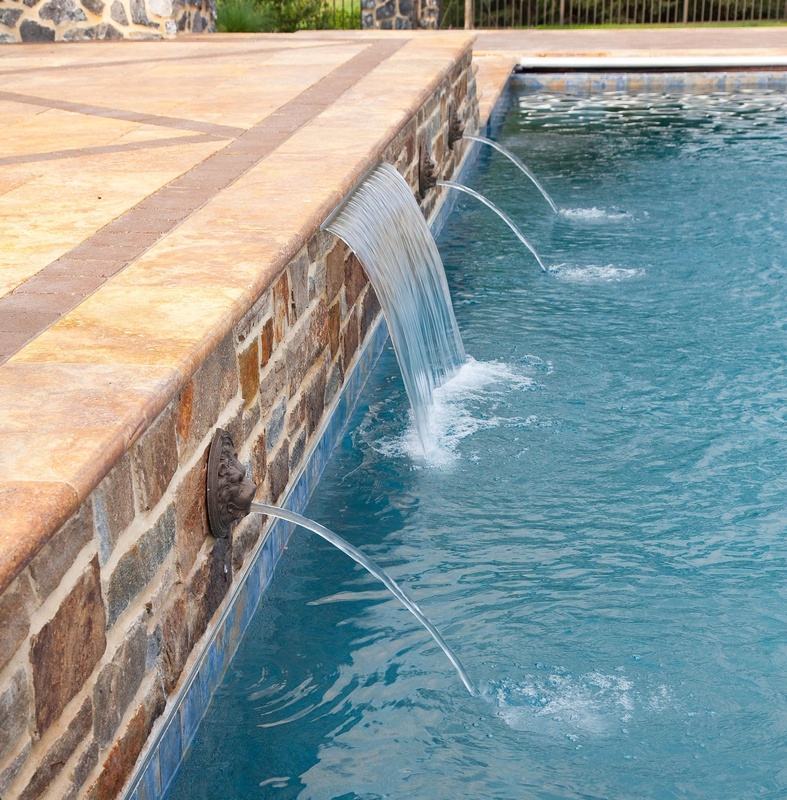 In terms of the pool shape, the family was clear that they wanted an automatic cover. That lead the design to be rectangular. 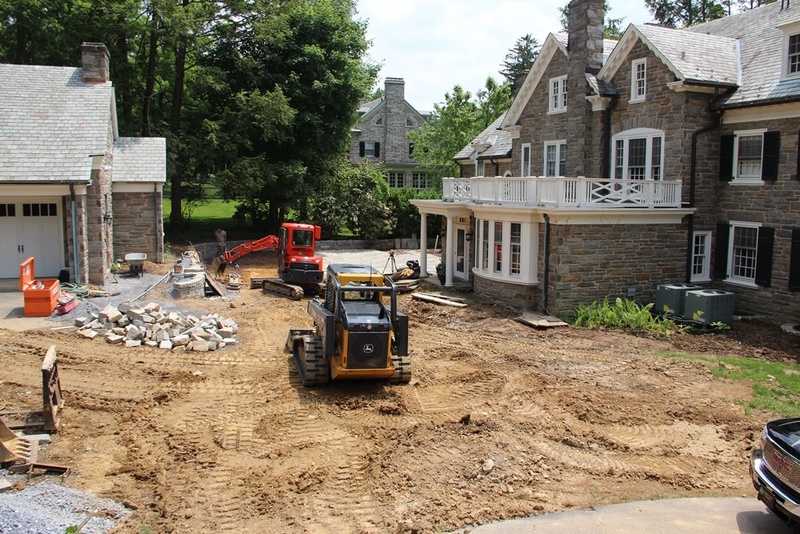 They also wanted the pool to be situated very close to the stairway that would connect to a new pavilion area. 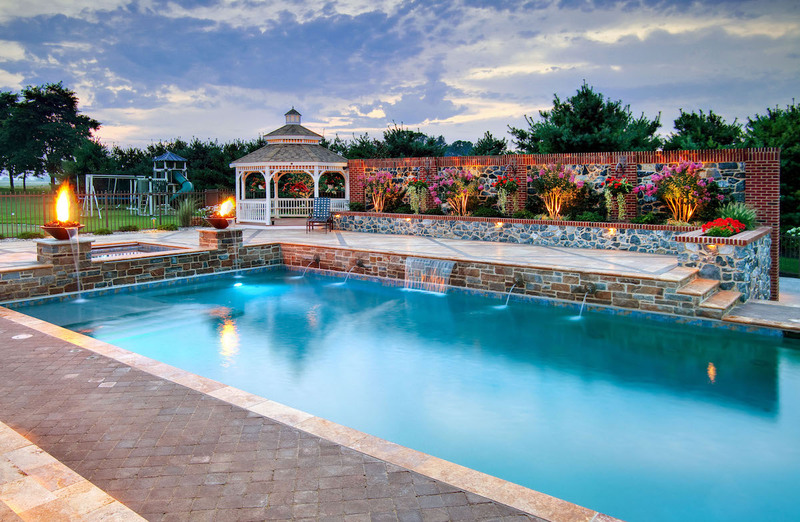 The addition of water and fire features around the pool also helps add to the ambiance both day and night. This included gas fire bowls as well as some water features such as a sheer descent water feature and some spouting lion heads that were a custom addition in response to the husband’s appreciation for the majestic animal. All along the way, of course, we aimed to make sure that the gazebo fit in with these plans. As a sentimental feature of the property, we wanted it to blend in nicely with the new space rather than somehow stick out. 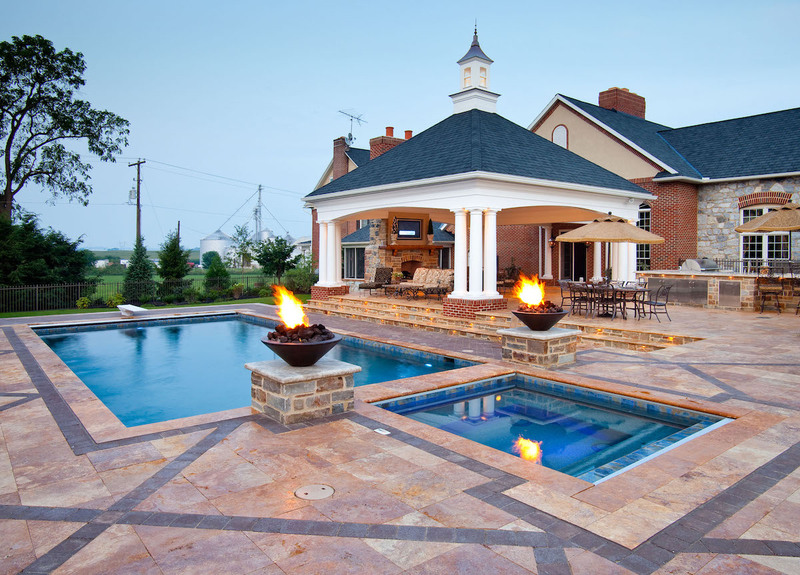 Adjacent to the pool, the new pavilion features an outdoor fireplace with an outdoor television and lounge area. 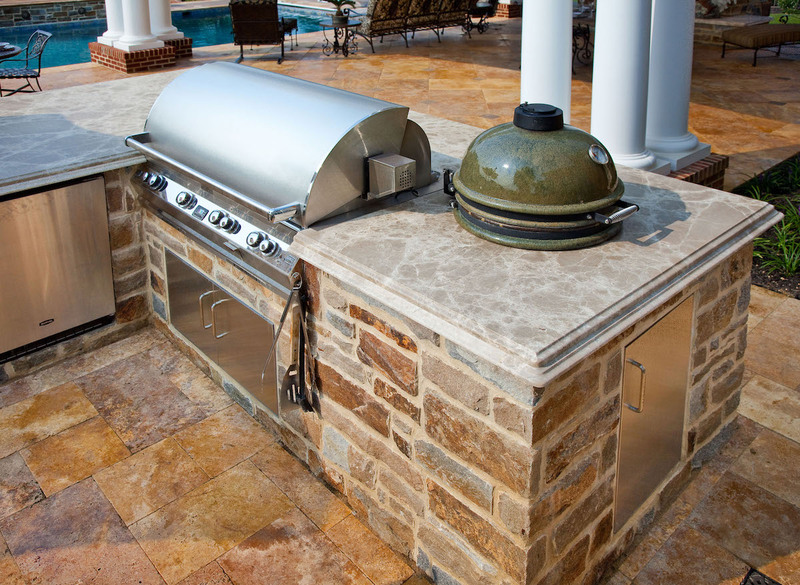 It also includes an outdoor kitchen with a big grill, a dishwasher, and the family’s Green Egg smoker. There was also a lot of custom cabinetry, some of which are on the outside wall of the kitchen, facing the pool, so that they can be stored with towels and sunscreen for pool guests. Another love—golf—was also represented in the new outdoor living area. 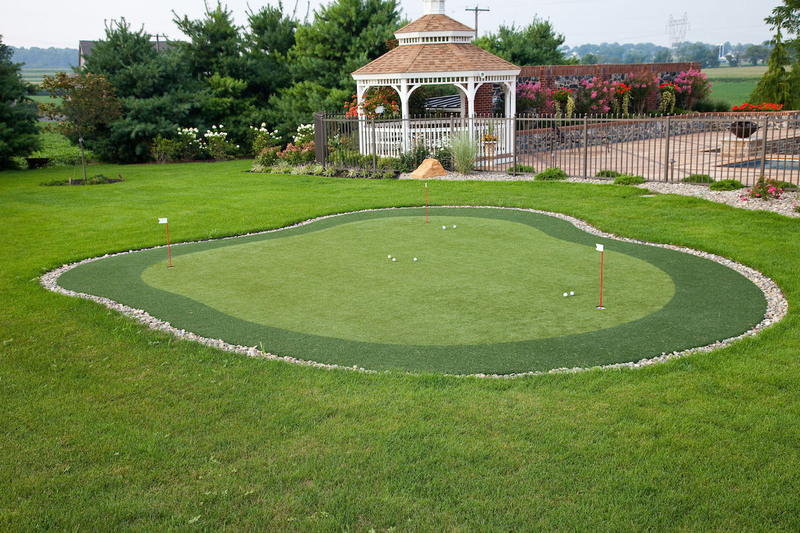 As an avid golfer, the husband wanted the ability to practice his skills at home. He wanted to be able to chip unto the putting green from a far distance so we situated the green in a way which made that possible. Another custom element of this project was a gate to the fence. The wife had recently been to the Philadelphia Flower Show and fell in love with a beautiful gate that was on display. We drew up a similar design, brought it to our metal fabricator, and had it created for the family. 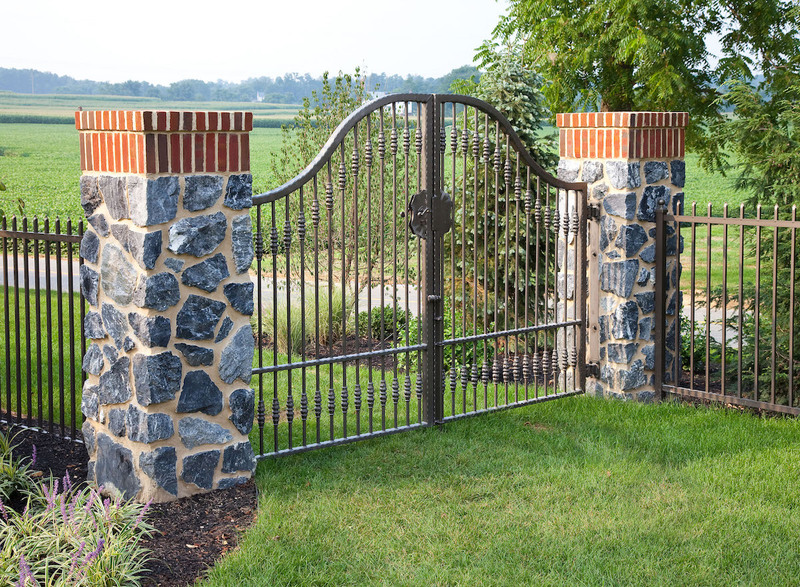 Flanked by two brick and stone pillars, the gate is now a gorgeous entrance to the property. The family also had a lot of specific ideas when it came to colors and materials. Inside the home, it was obvious how much they loved color and they weren’t afraid to mix and match bold choices. Outside, the family was not afraid to amplify the juxtaposition of different materials within this project. It made it a lot of fun and also incredibly unique to their personal style. The house itself was a mix of brick and limestone, so naturally, we used a nice mix of both brick and stone throughout the outdoor project, including the fence pillars. 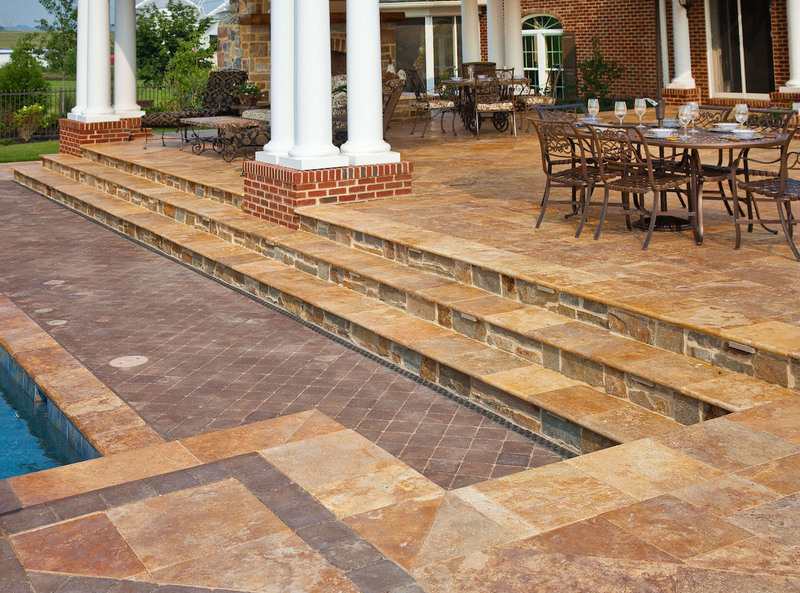 However, during the design process, the family fell in love with travertine, which we ended up using as the flooring inside of the pavilion. 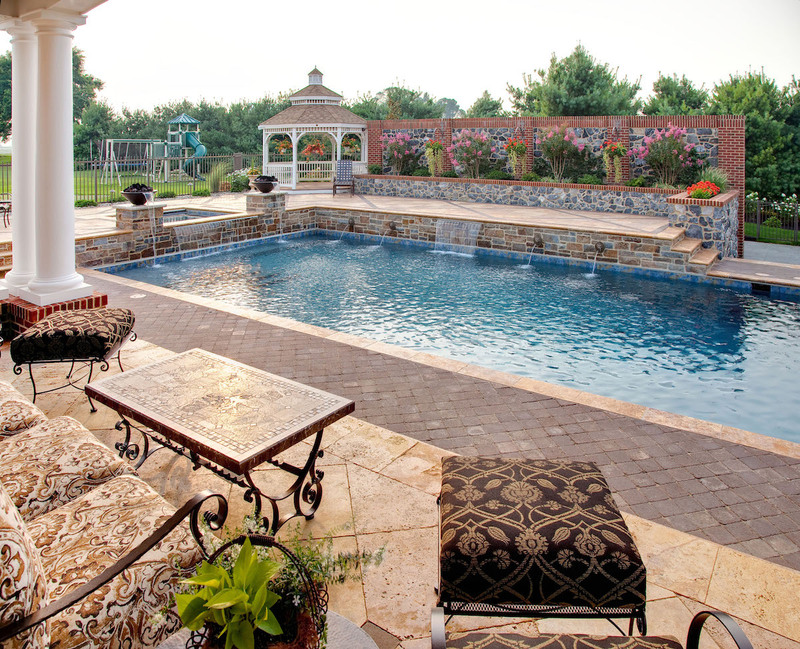 The pool patio is pavers with some unique geometric patterns to suit their flair for design. Even the use of walls throughout the property, which were installed for retaining purposes due to the sloping nature of the property, used a mix of materials. This family did not shy away from being bold in material choice. Walkways around the property also used a mix of materials, proving that you do not necessarily need to use the same material again and again in a project. In the front yard, there was a unique situation in that the family wanted to incorporate a mailbox into their front pillar. However, the mail carrier would need a landing area on which the mail truck could be briefly parked. Since we wanted it to look like a unique entranceway and not just a pad for the mail carrier, we utilized classic Belgian block that blended nicely with the stone and brick theme of the rest of the house and property. 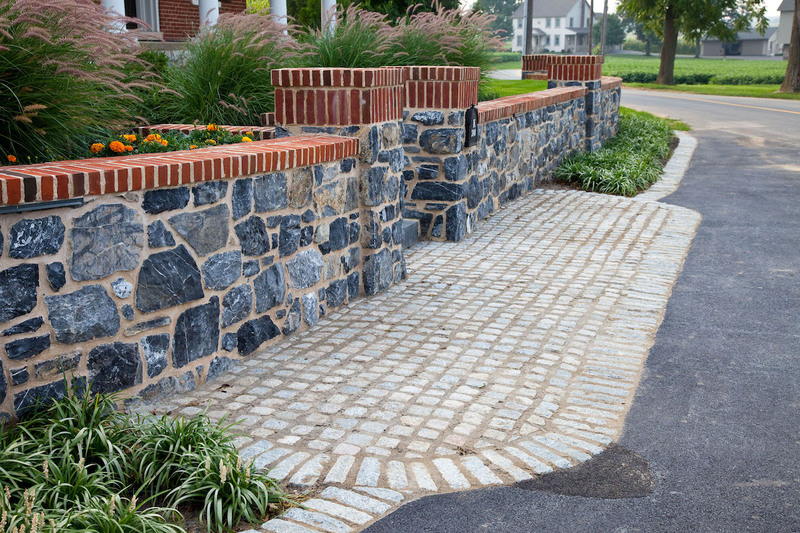 There is no question that this project featured a lot of hardscaping. But the landscaped areas around it really helped to soften the features. The family incorporated greenery right alongside walls and fencing for the very purpose of softening the look. 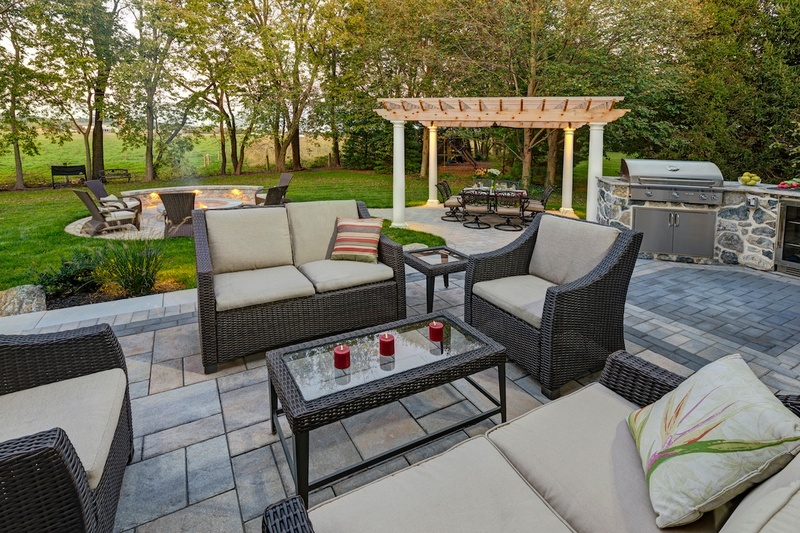 With the expansive backyard, the family also still had lots of green space, even with this new outdoor living area. And though they wanted a relatively low maintenance landscape, the family also incorporated appropriately placed bursts of color in hanging baskets and in some plantings, such as the crape myrtles we installed, to brighten it up. With all of these spectacular additions to the property, it only made sense that the family wanted to be able to use the space in the evening hours as well. This made the addition of outdoor lighting a truly essential element to the overall project. Lighting was added to highlight some of the project’s beautiful features and allow them to be aesthetically enjoyed in the evening hours (even if just the view from inside the home). But it was also added to make the space usable after the sun went down. 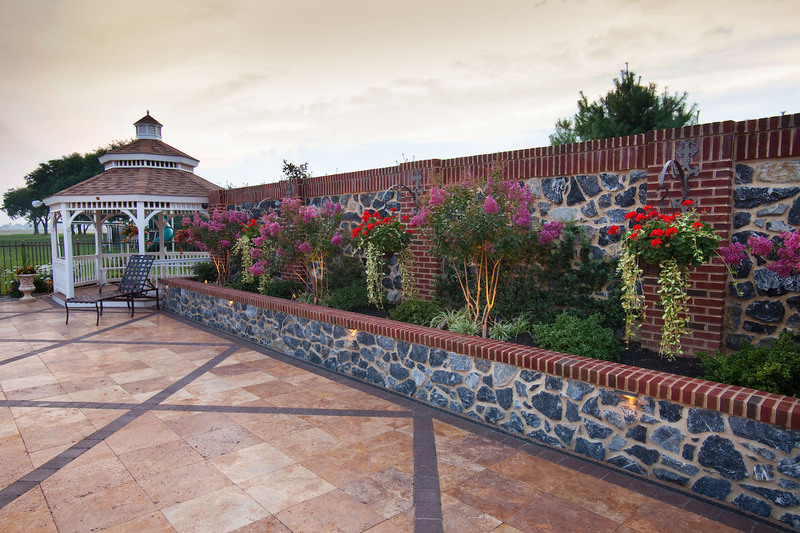 With such an involved project, there’s no question that working with an experienced landscape company was key. Considering the family had so many specifics that they wanted to be incorporated, it was also critical that they worked with a company that listened to their wants and needs. In the end, finding the right company to work with paid off for this local family. 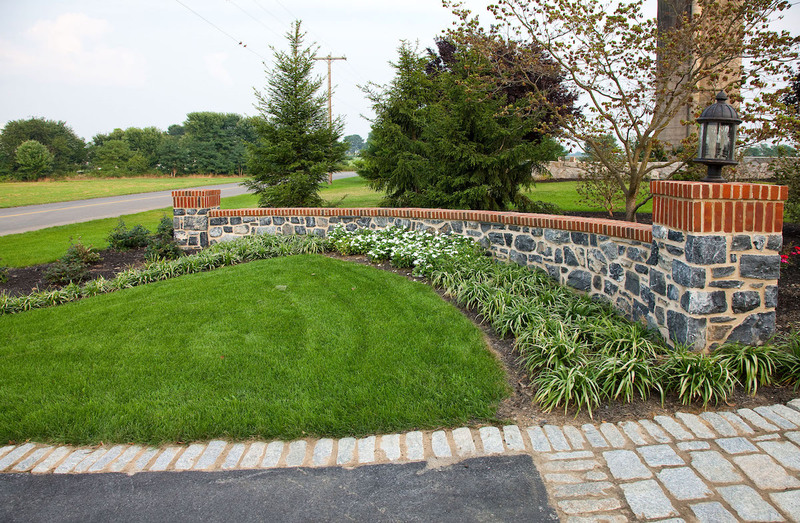 The fact is, your choice in Manheim, PA area landscaping companies could be the difference between a finished space that meets your expectations or one that is subpar. 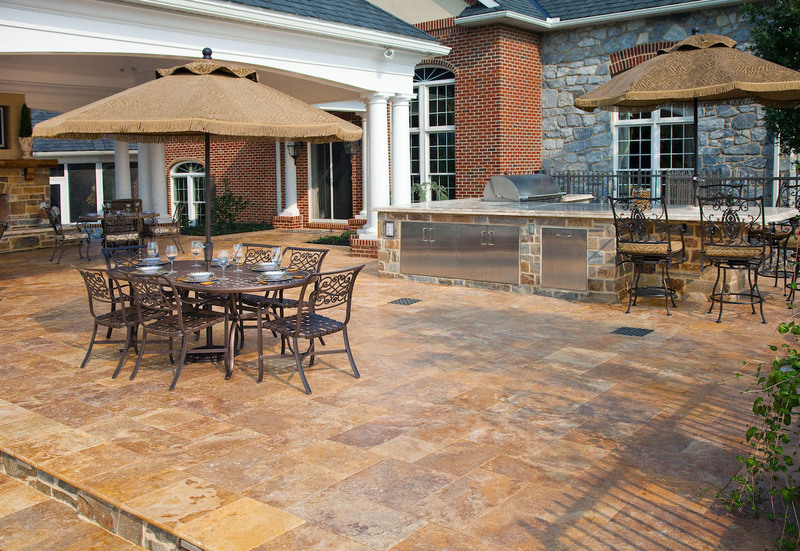 You want to feel confident that you’re investing in an outdoor living space that is truly your own. 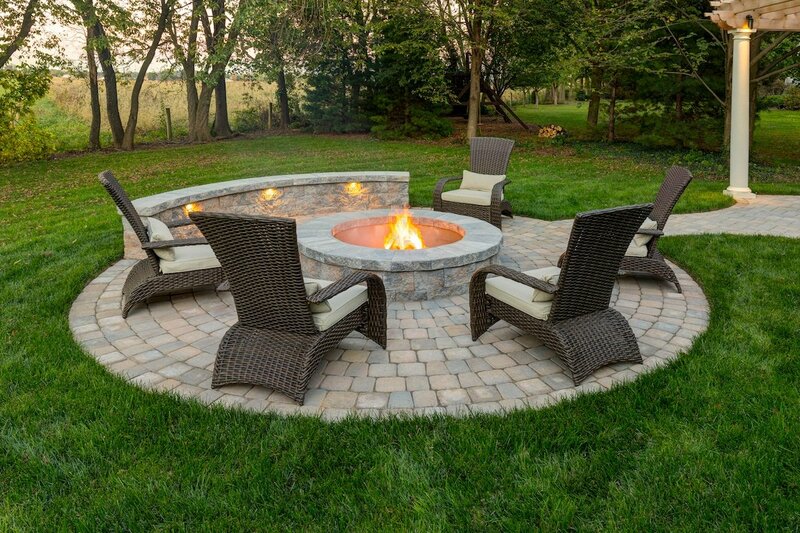 If you’d like to start a conversation about how we can bring your outdoor ideas to life at your Lititz, Ephrata, Reading, Manheim, Lancaster, Lebanon, or Hershey, PA home, contact us for a free consultation or give us a call at (717) 276-9447.